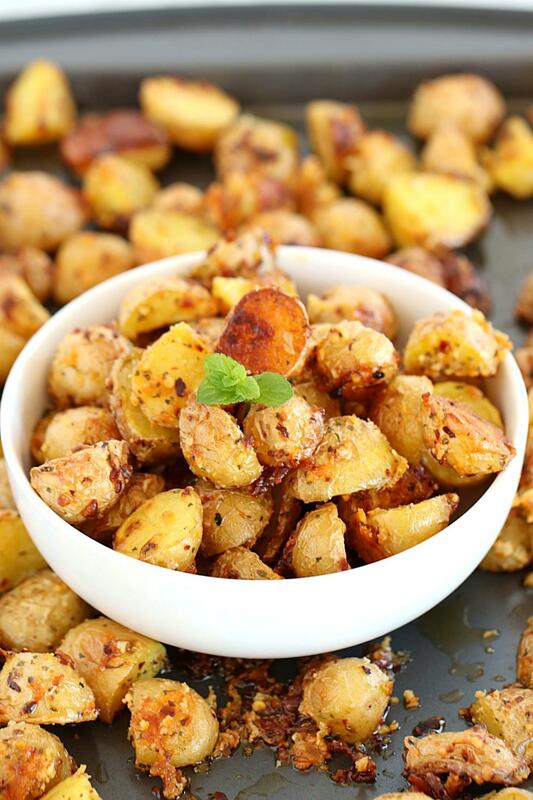 Oven roasted potatoes prepared with just five basic ingredients is a super healthy, simple and utterly delicious recipe! A perfect accompaniment to almost any dish — soup, pasta, salads or bread. 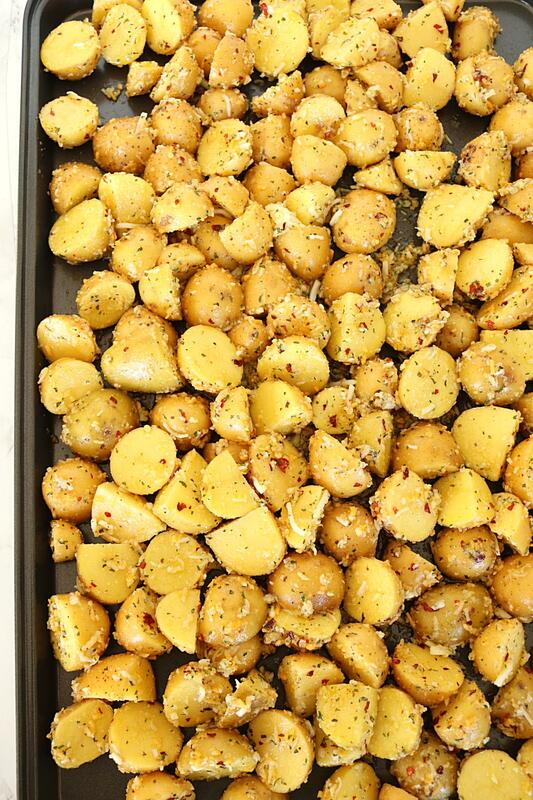 Raise your hands if you like an easy-peasy crispy oven roasted potatoes. We do, we love them! This is one of my favorite side dishes that come together in 40 minutes and is perfect for lunch or dinner. I call this recipe a one-pot meal. Catch a big bowl, add dry ingredients, olive oil, and toss in the potatoes. Arrange on the tray and bake. That’s it; it’s that simple. These potatoes bake beautifully in the oven – are crisp on the outside and tender on the inside. Try it tonight, and you won’t be disappointed. I have made this recipe a gazillion times, and it’s always a hit! How to make Oven Roasted Potatoes? This is a straightforward recipe with no complicated steps. 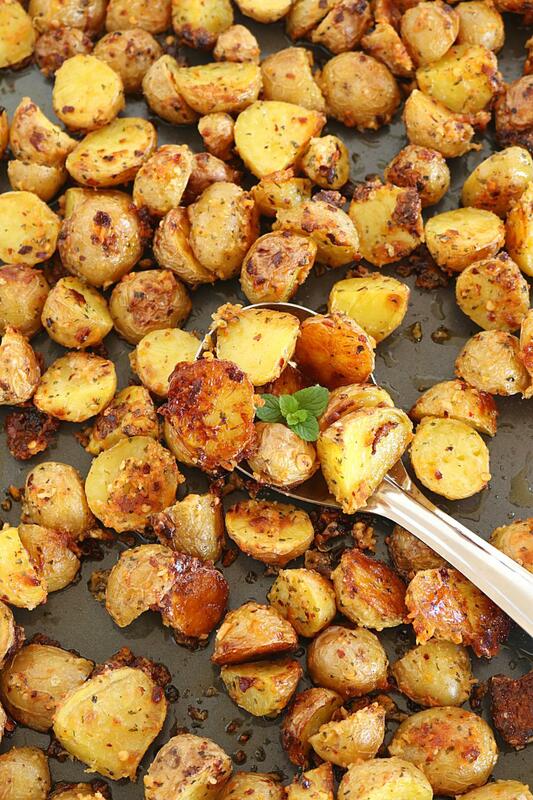 All you need is 5 wholesome ingredients to bake these yummy potatoes. The best part is that this recipe uses staples that everyone has in their pantry. Wash the potatoes thoroughly, and pat them dry. Cut them into cubes. The size of the potato is the real thing. If you prefer crispier potatoes, cut them into small cubes. For a softer bite, slice them in halves. To peel or not to peel baby potatoes is entirely up to you: just a note that potato skin adds nutrients and extra crunch. 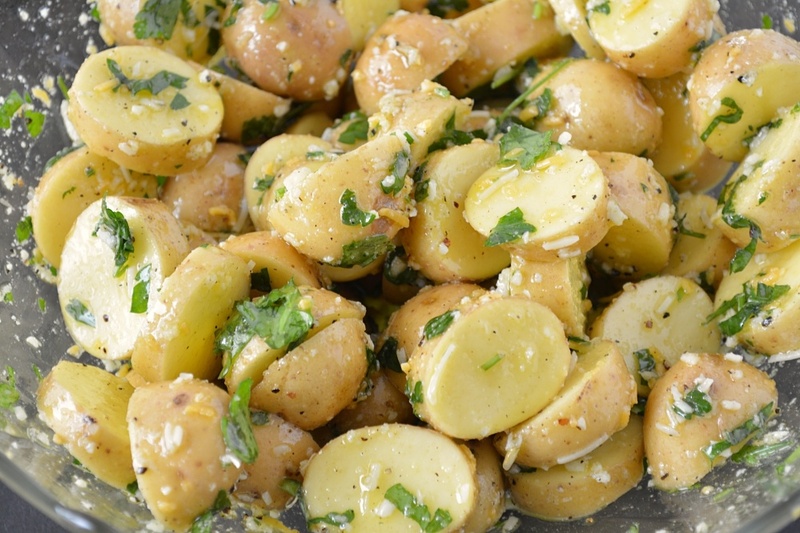 Prepare your olive oil mix and toss baby potatoes in that. Coat them well. Lay the potatoes on a greased baking tray in a single layer. Do not overlap them as they will become mushy. Bake until crispy and toasty. 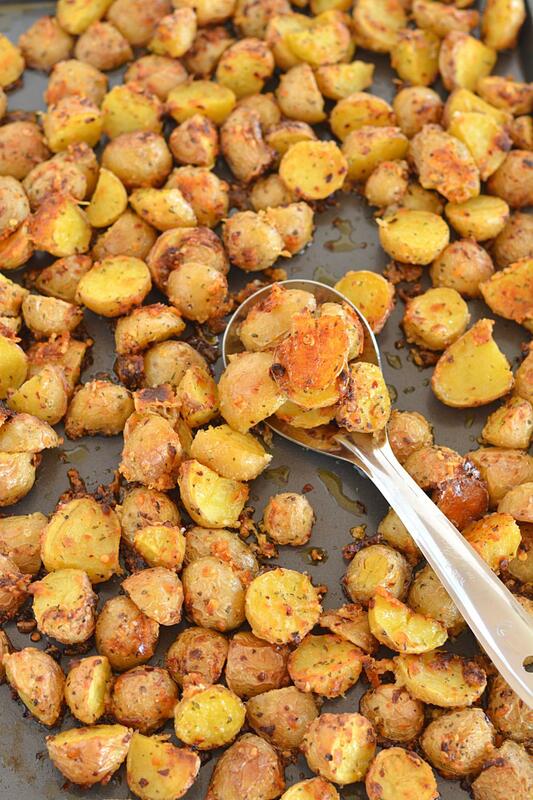 These are the BEST and easiest potatoes you will ever make! Gluten-free, healthy and amazingly delicious! What goes well with these potatoes? Oven roasted potatoes prepared with just five basic ingredients is a super healthy, simple and completely delicious recipe! A perfect accompaniment to almost any dish — soup, pasta, salads or breads. Wash and clean baby potatoes. Preheat the oven @ 425 degree F.
Leaving the potatoes, toss all the listed ingredients in a big bowl. Whisk and the dressing is ready. Add potatoes and mix, until all the potatoes are smeared in this dressing. 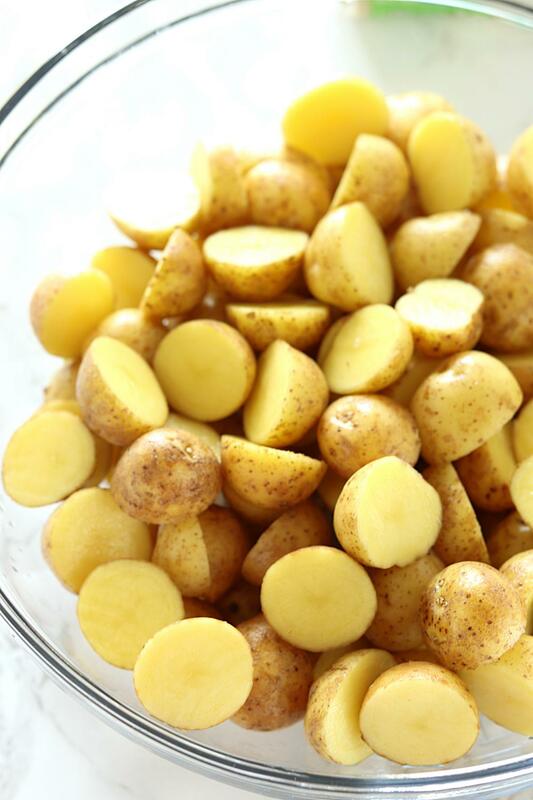 Transfer potatoes onto a greased baking tray and spread them in a single layer. Bake them in the preheated oven for 30-35 minutes or until crispy and toasty. A great accompaniment to any salad or pasta dinner. Or enjoy it as is like a evening snack. 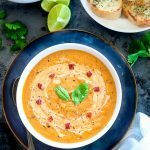 This recipe can be made vegan too. 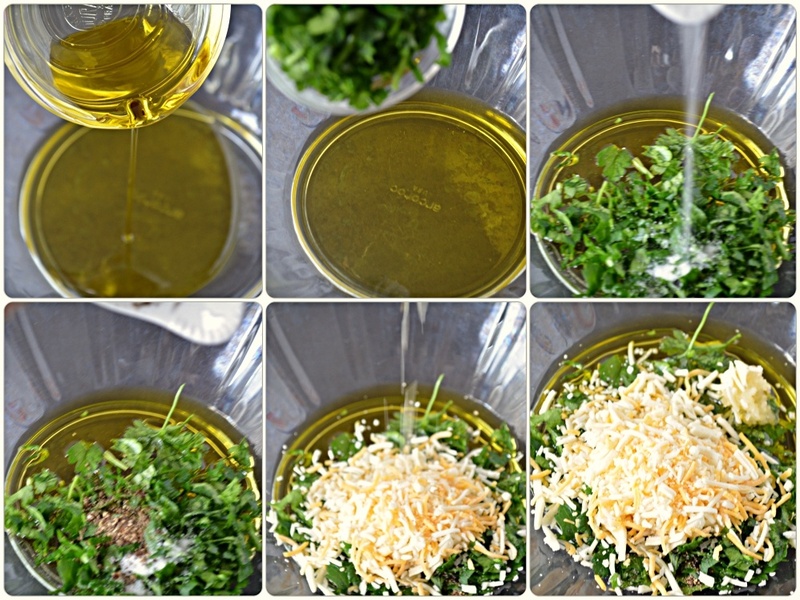 Simply skip the cheese and continue with the rest of the ingredients. Works great on sweet potatoes too. 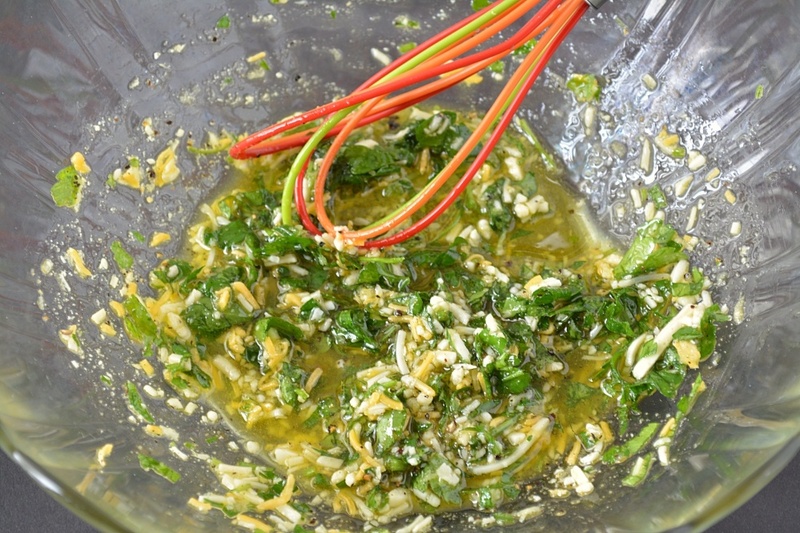 Substitute Parsley with fresh cilantro leaves. Wonder how chopped basil would be instead of parsley. Sound delicious. Going to try these with pork tenderloin. Yummmmm! That would taste super yum. 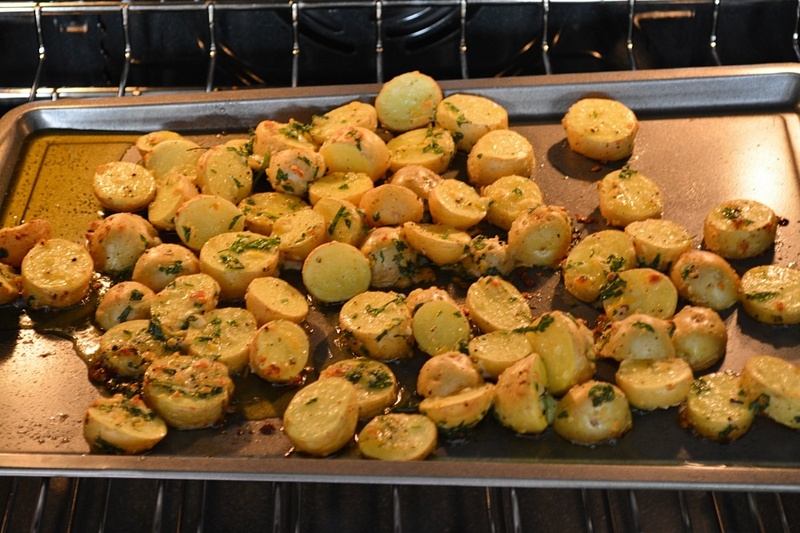 Have tried these potatoes with fresh basil and dill – they are equally delicious! 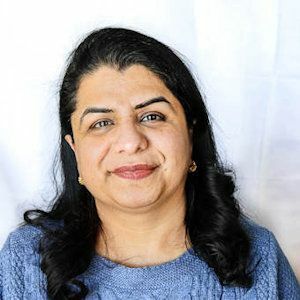 Thanks for the super recipe Ruchi. I tried it in my ‘air frier’ ,and everybody was asking for more. For a little change, I added some crushed mint (pudeena) leaves instead of parsley, and it came out well, with a very pleasant flavour. Thanks for sharing your wonderful feedback with me. Mint leaves is a great addition too! I usually make them with soups. We add rosemary rather than cilantro. When we make for Indian gathering we sprinkle chaat masala while serving. Ditto, love them with soup and bread! Thanks for sharing a lovely tip! Adding a tbsp of flour to the oil makes these even crispier, and a tsp of red chilli flakes adds a nice kick if you want a bit of spice. Thanks for a wonderful tip Johnny! can we bake this in microwave.if so for how many minutes. Yes, you can bake these potatoes in your microwave in the convection mode. Absolutely amazing recipe and display… Hats off…. Looks and taste so so so great. I could sit down with a whole bowl of them! Admire your way of cooking. These are simple and absolutely delicious, loved the flavor. So crispy and loaded with flavor. Add some more cheese and they had a crunchy top.Next time I’ll double the recipe because my family loved them so much that I didn’t had enough left for second serving. This recipe was awesome and so easy to do. Amazingly Tasty and my family couldn’t stop eating them! I loved the flavor. Great recipe! While baking the full house was filled with delicious smell of potatoes. !Yaaay. Definitely a winner and Will be using this again! Good recipe for beginning cooks like me who are unsure of how to actually bake a potato.These came out perfect! My only change was I cut the potatoes into long strips and they were crispy and crunchy. Thanks for sharing. You are welcome Paula! I bet the long strips of potatoes must have tasted super yum. Thanks for giving me a great idea and thanks for stopping by!! Great idea Renato, I am sure that must have tasted crispy and yummy. Thanks for stopping by!! Made this yesterday and were a success. Thanks Ruchi. Thanks Mamta! Glad you liked it!! Liked it very much.It can be eaten as snack or as a meal with chapati. Thanka Tanya, Glad you liked them! !